NOTE: Kubernetes has evolved! These directions are no longer entirely accurate because of this. If you’re looking for current info on deploying Kubernetes, please reference the related config files in my GitHub salt repo. I’ll be doing my best to keep those as up to date as possible. 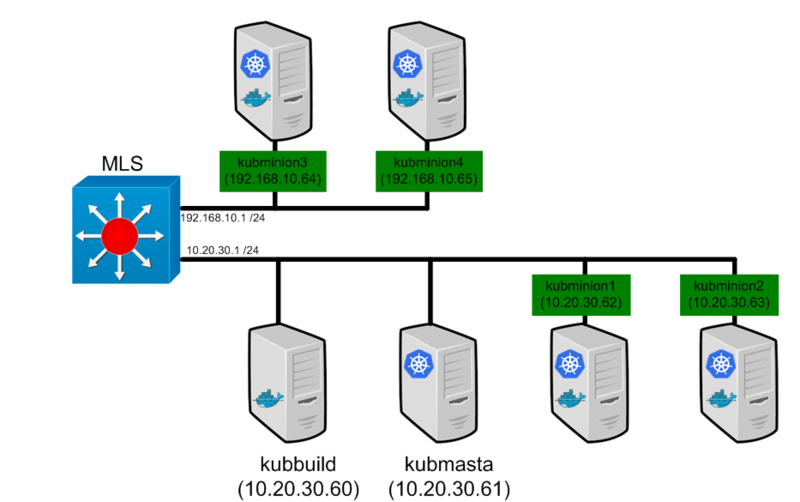 In this series of posts we’re going to tackle deploying a Kubernetes cluster. 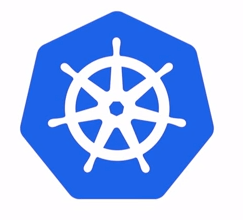 Kubernetes is the open source container cluster manager that Google released some time ago. In short, it’s a way to treat a large number of hosts as single compute instance that you can deploy containers against. While the system itself is pretty straight forward to use, the install and initial configuration can be a little bit daunting if you’ve never done it before. The other reason I’m writing this is because I had a hard time finding all of the pieces to build a bare metal kubernetes cluster. Most of the other blogs you’ll read use some mix of an overlay (Weave or Flannel) so I wanted to document a build that used bare metal hosts along with non-overlay networking. In this first post we’ll deal with getting things running. This includes downloading the actual code from github, building it, deploying it to your machines, and configuring the services. 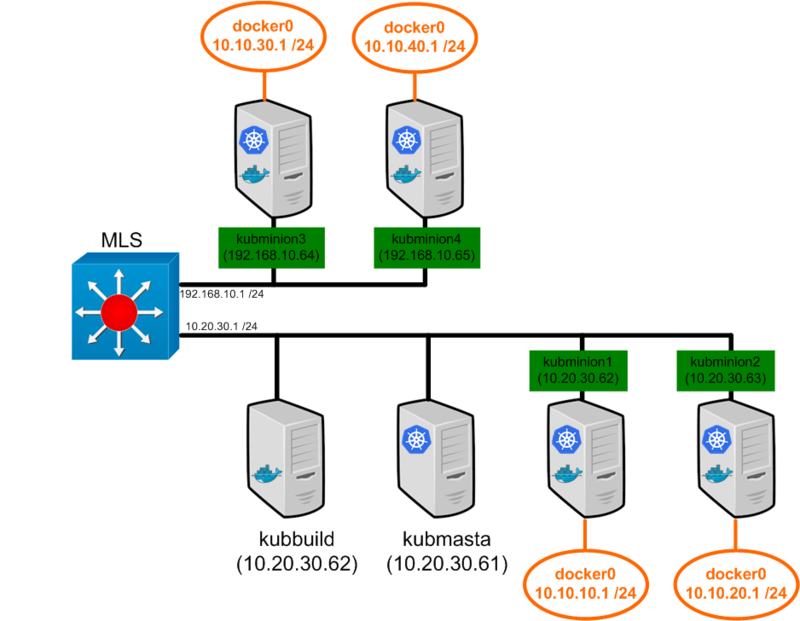 In the following posts we’ll actually start deploying pods (we’ll talk about what those are later on), discuss the deployment model, and dig into how Kubernetes handles container networking. That being said, let’s jump right into what our topology is going to look like. So we have a total of 6 hosts. 5 of these hosts will be used for the kubernetes cluster while the 6th one will be used for downloading, building, and distributing the kubernetes code to the cluster. The network topology is fairly basic with a multi layer switch (MLS) supplying connectivity for two distinct subnets. The MLS also acts as the default gateway for the subnets providing access out to the internet (not pictured). Note: All of the hosts are starting with a basic configuration. This includes installing CentOS 7 minimal, configuring a static IP address, configuring a DNS server, and doing a full update. 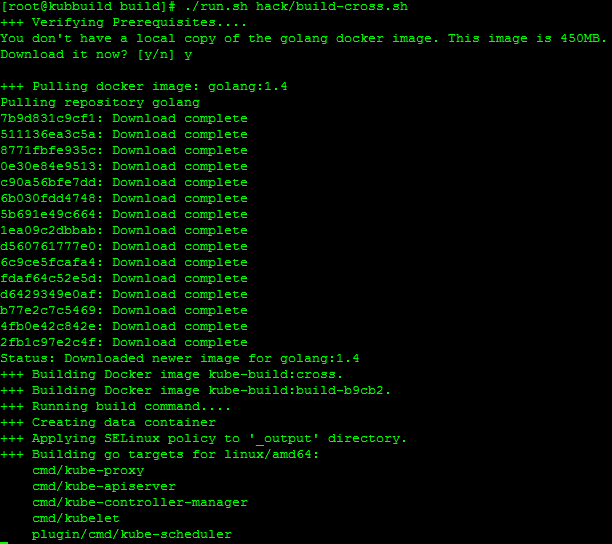 So at this point, we have a fairly basic system running Apache and docker. You might be wondering why we’re running docker on this system. 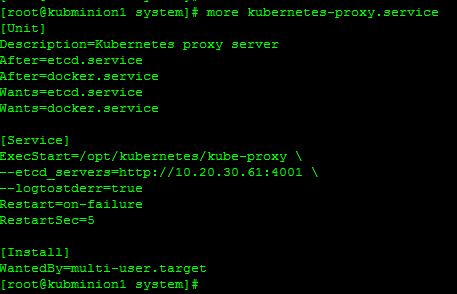 The kubernetes team came up with a pretty cool way to build the kubernetes binaries. Rather than having you build a system that had all of the required tools (Namely GO) the build script downloads a golang container that the build process runs inside of. Pretty cool huh? This will copy the entire repository down from github. If you want to put the repository somewhere specific make sure you CD over to that directory before running the git clone. Since this machine is just being used for this explicit purpose I’m ok with the repository being right in the root folder. Once the clone completes we can build the code. 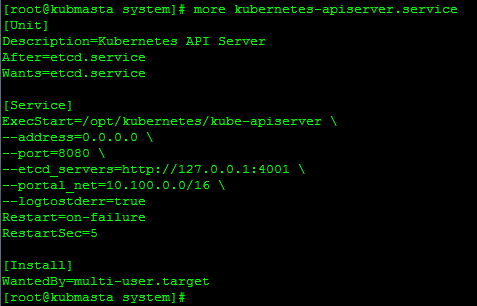 Like I mentioned, the kubernetes team offers several build scripts that you can use to generate the required binaries to run kubernetes. We’re going to use the ‘build-cross’ script that builds all the binaries for all of the platforms. There’s more info on github about the various build scripts here. When the build is complete, you should get some output indicating that the build was successful. The next step is to get the binaries to all of the kubernetes nodes. To do this, I’ll copy the files via http from kubbuild over to each of the hosts. Note: There are probably better or easier ways to do this. It doesn’t really matter how you do it so long as you get the correct binaries on the correct machines. We’ll walk through all of the service files when we build the kubernetes nodes. So let’s move onto building our first kubernetes node, kubmasta. 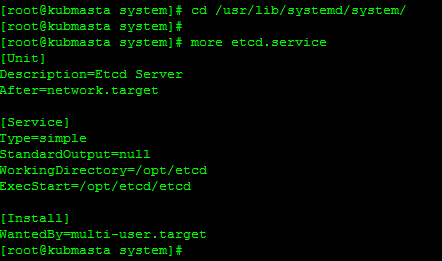 A service file just tells systemd what to do. Each service is also called a unit. In this case, the unit file has 3 sections. The unit section describes the name of the service along with any service requirements. In this case, we give the unit a description and tell systemd that this service can start after the network.target starts. The service section describes what we want the service to do. The big item to pay attention to here is the ‘ExecStart’ command which tells systemd what process to run. Note: I owe a blog entry (or two) dedicated just to systemd. Im trying to cover enough to get you going without getting stuck in the weeds here. For now, you can just use my unit files but I will be generating a blog later to talk specifically about what each and every item in the unit files does as well as dive deeper into targets. The last section is the Install section. This tells systemd when to launch this process. In our case, we’re telling systemd that this unit is wanted by the multi-user.target. For now, just know that this is the equivalent of enabling the service to run at system boot. So these descriptions make this pretty straight forward. We’re defining the address that the API Server should listen on as 0.0.0.0 which defines all the available interfaces. We specify the port as 8080, the location of the etcd server (local), and we define a portal net. The only odd ball there is the portal net but we’ll be covering that later when we talk about services. 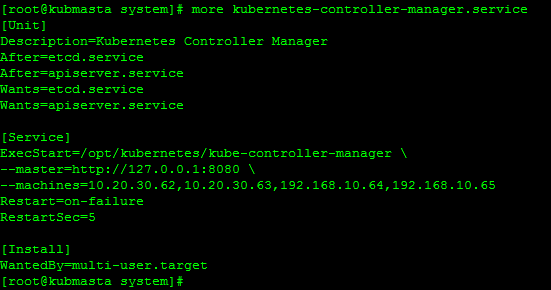 Note: The kubernetes team has done a great job with the command documentation. If you want to see the options you can pass to any of the other binaries you can do the same thing I did above by passing the ‘–help’ flag to the binary to see that flags you can specify on run. In the case of the controller manager service we pass the service two variables. 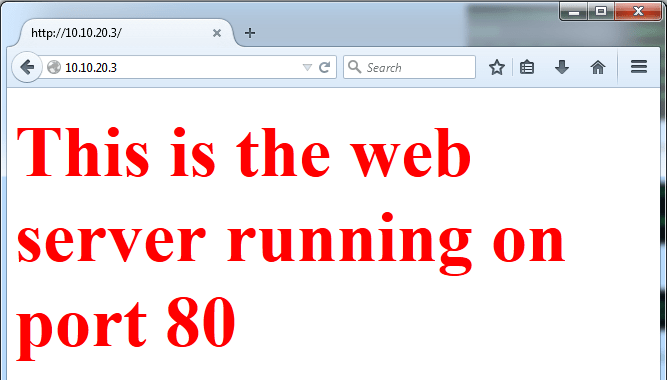 First we tell it who the master is, in this case, that’s the localhost. Secondly, we tell it where the minions are. In my case, I define IP addresses for each of the 4 minion machines. Notice how some of the unit definitions for the services depend on other services as well. In this case, we’re telling systemd not to start the controller manager until the API server is running. Here we just tell the scheduler where the master is. Again, that’s currently just the localhost. Success! So we’re successfully interacting with the kubernetes. Granted, none of the minions are running yet but things are looking good. Now let’s move onto building the first minion. Success! The next step is to configure the remaining 3 minions. Just what we expect to see. So it appears that kubernetes is running as it should be. 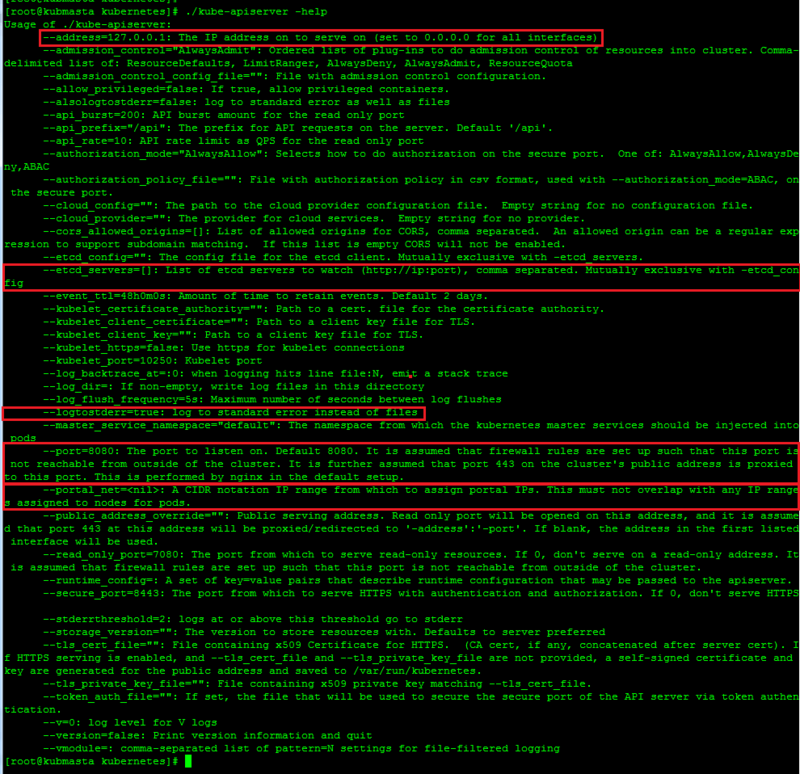 For now, use the following commands to clean up the cluster. Keep in mind that we haven’t even scratched the surface in this post but we should now have a solid base to continue building on. In the following posts we’ll start tearing into the kubernetes constructs and how they map into the cluster. thank you for the very interesting article. cannot wait for the next post on kubernetes! on minions, but don’t download kubectl to those machines. is that intentional? Im writing the next one right now so its coming up shortly. 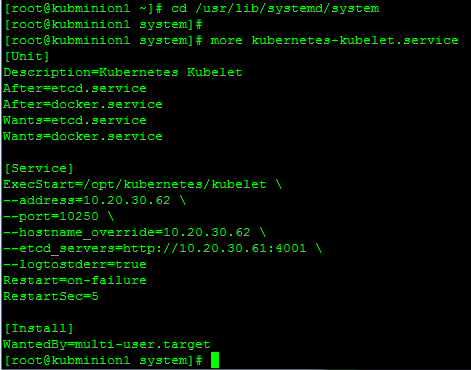 Yes, for now I only want to control the cluster from kubmasta (thats what kubectl is used for) so I didnt copy it down to the minions. Making the symlink on the minions was a mistake. Thanks for spotting that! I’ve fixed that and the IP issue you caught. Thanks for reading!